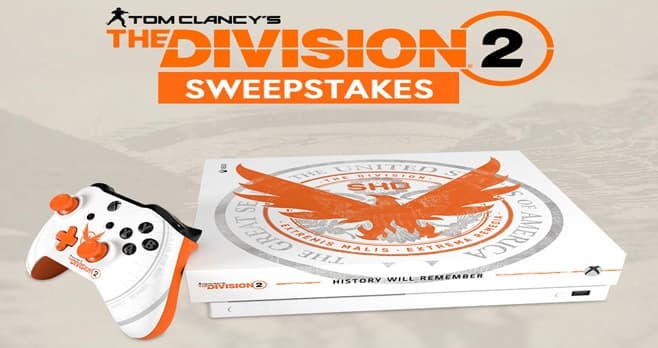 GameStop PowerUp Rewards Sweepstakes: GameStop invites gamers to enter this Sweepstakes for a chance to win a custom painted Tom Clancy’s The Division 2 Xbox One X Console valued at $2,500. Use your PowerUp Rewards points to enter by April 30. The GameStop PowerUp Rewards Tom Clancy’s The Division 2 Sweepstakes is open only to legal residents of the 50 United States and the District of Columbia who are 18 years of age or older at the time of entry. The Sweepstakes begins 12:00 AM ET April 1, 2019 and ends 11:59 PM ET April 30, 2019. Limit five hundred ten (510) entries per person and per PowerUp Rewards Member account for the duration of the Sweepstakes Period, regardless of method of entry. The grand prize consists of a custom painted Tom Clancy’s The Division 2 Microsoft Xbox One X Console. Visit www.gamestop.com to enter and see Official Rules for details.